Urcelia Teixeira is a mystery and thriller author of clean, fast-paced action-adventure novels. Her books have been compared to that of Clive Cussler. 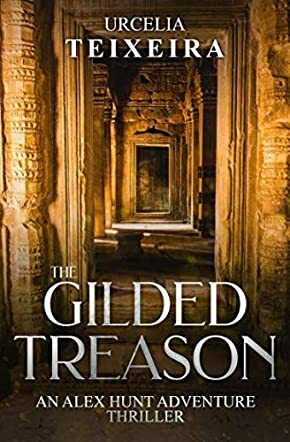 In The Gilded Treason: An Alex Hunt Adventure Thriller by Urcelia Teixeira, Alex (short for Alexandria) Hunt is an archaeologist/explorer who, along with her fellow explorer Dr. Sam Quinn, is hired to find and return a lost golden urn by the Cambodian government. The urn is said to contain the remains of the ancient Buddha himself. There is also a rumor that the urn may be a fake. As the story unfolds, other nefarious types are after the urn as well. The hunt for the golden urn begins with the pair finding danger climbing a mountain in the jungles of Cambodia. Soon they find someone is trying to kill them before they even find the urn. There is a Crocodile Dundee-like character, complete with an over the top Aussie accent, who saves Alex and Sam and who apparently lives in the jungle. There is a Buddhist monastery with secret underground tunnels and sinister bad guys lurking in dark places in the seamier parts of Cambodia, all chasing Alex and Sam. The Gilded Treason: An Alex Hunt Adventure Thriller by Urcelia Teixeira is the second book in a gripping series. The Gilded Treason is a fun read with enough twists and turns to keep the reader engaged with the characters and central plot of the book. Like Clive Cussler’s Dirk Pitt series, the main character, Alex Hunt, is the center of the story and is a likable heroic figure. Alex must use her wits to stay alive as she displays an Indiana Jones style bravado and derring-do with Sam’s help. The dialogue between Hunt and Sam Quinn is entertaining. I really liked the story and the characters. An enjoyable read and a delightful, non-stop, rollicking adventure story to please fans of the genre, to be sure. Thank you Steve Leshin and Readers’ Favorite! I’m thrilled!